"Toy: Nurse Doll J" by Normadeane Armstrong Ph.D, A.N.P. 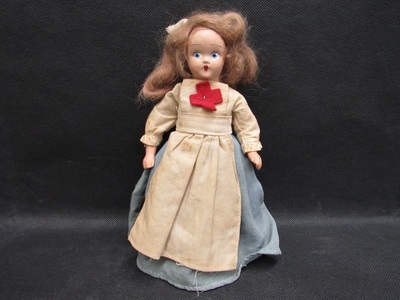 This is a doll dressed like a nurse from around the Civil War. The doll is made from either a hard plastic or wood and all the facial features appear to be hand painted. A red cross sits prominently on the dress and a cap is worn as well, both are stapled to the doll.